East Los Santos in GTA III Era. Portions of Las Colinas, Los Flores and East Beach are visible in the background. East Los Santos is a large district in the east of Los Santos, hence the name. It exists in Grand Theft Auto: San Andreas and Grand Theft Auto V. It is based on the real life district of East Los Angeles and the district is controlled by the Ballas gang. East Los Santos has, prior to early 1992, had areas controlled by the Los Santos Vagos and the Grove Street Families. There are two known residents of East Los Santos: Freddy and Melvin "Big Smoke" Harris, who moves to East Los Santos from Idlewood. In Grand Theft Auto: San Andreas, East Los Santos is a stronghold for the Ballas gang, who use the area as a base to launch attacks on Grove Street Family gang members in Ganton. Conflict between the Ballas and Los Santos Vagos gangs does not occur in East Los Santos, due to the two gangs co-operating with each. Carl Johnson and Denise Robinson meet in East Los Santos during the mission Burning Desire. Carl had set on fire some homes owned by the Los Santos Vagos, however Carl rescued Denise from the fire after hearing her cries for help. 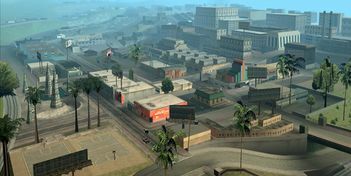 East Los Santos is also the main setting for the final mission of Grand Theft Auto: San Andreas: End of the Line. During this mission, Carl Johnson fights his way past Ballas, Los Santos Vagos, San Fierro Rifa and Russian Mafia gang members in order to reach Big Smoke, who he then kills. Frank Tenpenny then sets Smoke's Crack Palace on fire, leaving Carl having to fight his way back out of the building whilst also combating the flames. After escaping the building, which suffers a series of explosions as Carl escapes, Carl and Sweet chase Tenpenny through East Los Santos and other districts. This page was last modified on 23 November 2012, at 14:36.